Manufactured by Watson Company, this Art Nouveau sterling and cloisonne hatpin dates to the early part of the 1900s. 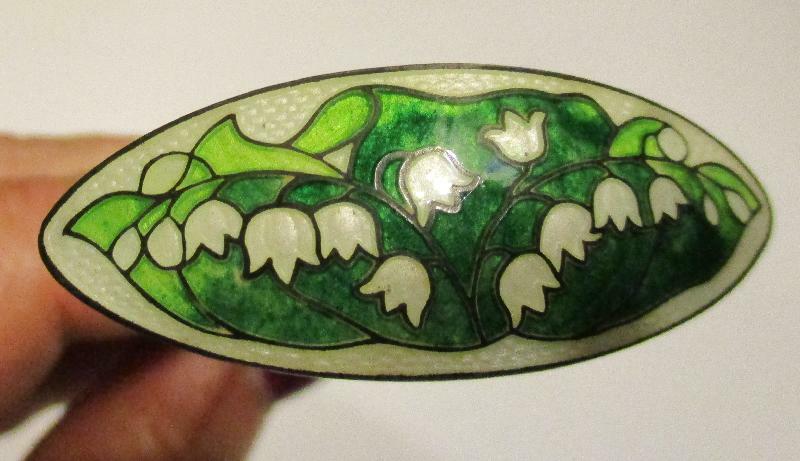 The oblong top has an enameled lily of the valley and leaves design. The flowers’ stems and outlines of the leaves are sterling and the background is white with a woven pattern. The back of the head has GENUINE CLOISONNE in an oval with a crown, “W” and lion next to STERLING in another oval just below. The shaft doesn’t appear to be sterling as it has some discoloration and doesn’t appear to be marked as such. It measures approx. 8 1/2L and 2 wide across the head.